Right now, I am all about Andalucia, Spain, and tapas. I recently accepted a position as the PR Director for a brand-new resort - the Intercontinental Montelucia Resort and Spa - a loosely Andalucian-themed luxury resort, spa and private villas opening next year in the oh-so-beautiful and exclusive Paradise Valley, Ariz. While that means I have to leave my current job (that I did love and had tremendous loyalty toward), I am nothing but excited for the future - and a healthy dose nervous which feels great. All of this change has me crazy for Spain and specifically Andalucia (the home of tapas, reportedly) and craving a favorite tapa and a glass of Spanish wine to go along. I first tried making patatas bravas when I was in 6th grade (thanks to the Spain collector's edition of Bon Appetit magazine in 1992 that I recently re-purchased on eBay for nostalgic purposes) when I cooked a Spanish-themed dinner party for my family (I started young). I ate patatas bravas again during my first trip to Spain years ago at a tapas bar, and again recently at an Arizona tapas bar Sol y Sombra. And tonight, I made it again, just for myself. Salud (cheers!) to fried potatoes in any variation, a tall glass of Spanish wine and a next phase of my career. Saute onions, garlic, tomatoes, salt and pepper and paprika in olive oil until softened. Add wine and de-glaze pan. Simmer, then add broth. Simmer until reduced slightly, then blend or food process mixture into a sauce. Let stand. In the same (now paprika-stained) pan, heat more oil - enough for a shallow pan-fry (about 3/4 of an inch), heat over medium-high heat. Add potatoes and pan-fry, adding salt and pepper. Cook until golden brown on all sides, tossing periodically. Remove potatoes with a slotted spoon, let drain on a paper-towel lined plate. Serve, sprinkling with additional salt if needed and top (or serve on the side) with paprika sauce. Garnish plate with dusting of paprika. Congratulations on the new position. These potatoes sound delicious. Have you ever tried making these with smoked paprika? I recently picked up a big bag of it at Penzey's and am trying to think of inventive ways to use the spice. I WISH I had smoked paprika for this recipe...sadly I just used what I had. It would be perfect for this recipe. I know it's almost sacreligious, but I might next time roast the potatoes (to get the crisp but with less oil) and serve the sauce on the side. Either way, its such a yummy dish! Nice dish and a testament that we all eat similar things...fries here at a pub/bar...patatas bravas at the tapas bar! Congrats on the new job! This paprika sauce sounds wonderful! This sounds delicious. Congratulations on your new job! Congratulations on your new job! It must be very exciting! 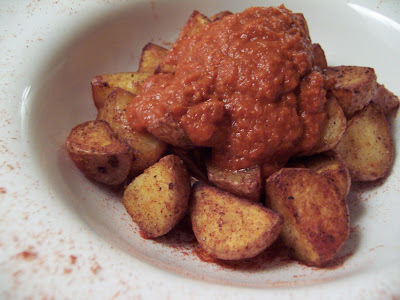 thanks for posting the recipe for las patatas bravas! i love them, too! bookmarked it! What a great way to celebrate your marvelous new job! What Spanish wine did you drink? Not something I would normally throw on potatoes but it sounds and looks good! 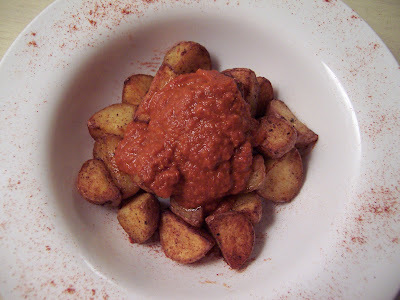 yum, i love patatas bravas and was happy to stumble upon this recipe! Oh wow! Congrats on your new job. It sounds perfect for you! Have fun with your new adventure. Here's to the future, and yummy food! These potatos look great. What kind of Spanish wine do you get? I just bought a Spanish wine for the first time the other day (Tapeña, have you tried it?) and now I'm finding myself in the mood for Spanish fare. I'm going to try these potatoes next weekend. Thanks! Looks delicious, cheap and easy! Perfect for a Spanish-themed dinner party!